Trnava, on paper, on your map as you unfurl it in the car on the drive east out of Bratislava, is a regional town: it’s close enough to Bratislava to commute for locals, it is not far enough away from Bratislava to waylay tourists with limited time bound for the wilder adventures of the Slovak mountains beyond. On paper. The tourist board makes much of the town’s exceptional churches, quite rightly, as a way of attracting visitors. But perhaps Trnava’s most obvious attraction is staring everyone in the face, gracing the side of the main square there: one of Slovakia’s most elegant cafes. One which will impress you even when compared to Bratislava’s, or indeed Vienna’s selection of coffeehouses. 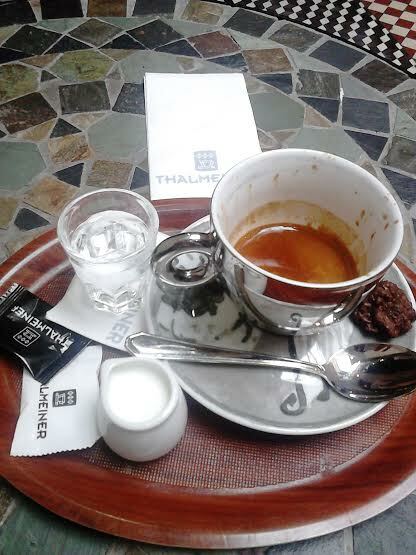 I walked through the door of Thalmeiner and I was transported: the stylish Art Deco-style prints on the walls, the abstract tiled tabletops, the burnished brass old coffee roaster, the suave waiters. This is the type of joint far-bigger cities than Trnava (Bratislava and London included) would love to covet and no wonder – I can think of very few places in Bratislava or in London to compare with here. Thalmeiner transplanted to either place would be overcrowded, with weary, curt staff and probably queues out the door. And when I go in someplace for coffee, I don’t want curt staff or queues. I want to lose myself in the atmosphere, people-watch, order a damned good macchiato, and sketch out a scene in my novel, write that article or that shopping list without hassle but with a smidgeon of the old-fashioned glamour so regrettably absent from the world these days. Which makes Thalmeiner and me pretty well suited. One would be content to sit quite some time without even ordering, and just checking out the decor. Thalmeiner’s specific and finely-honed style is an intelligent Art Deco-ising with its original artwork: even the town’s water tower is made into an iconic print here, with a larger-than-life chess piece advancing across an imaginary board in front of it. Or take the cafe’s flagship image: a thundering old steam engine with a cup of coffee emblazoned across the foreground and a sign proclaiming “EXPRESS” (a clever play on old express trains and espresso). The gleaming old coffee grinding machine might waylay you on the way in, too, as will choosing your nigh-on obligatory cake from the counter. I took a pew out back in the covered leafy courtyard, because there were no seats free in the main part. I took a look around me. What I liked was that clearly all types of Trnava folks (not just the law students or the middle-class artsy types) were descending on Thalmeiner for their caffeine fix. Not that there weren’t a fair few intense-looking younguns tap-tapping away on their laptops, there were. But there was none of the cliquishness that exists in some cafes and bars intent on creating a certain ambience: there were grizzled locals, too, even a group of very macho-looking men you wouldn’t expect to see in any type of place other than the nearest krčma (pub)! The service overall? Ultra-professional and friendly, rather than over-the-top and condescending. And when that coffee comes – ah! Presentation, as with everything else at Thalmeiner, is integral down to the finest insignia on the saucer. Drinks come on chunky silver cups with more of the Art Deco imagery on the sides. The condiments are all Thalmeiner-brand. A glass of water and a small chocolate cake come with the coffee. I always look forward with relish to that moment when the fruitiness of a well-made coffee hits the back of your tongue, and Thalmeiner, unlike many places that make far greater claims, does not disappoint. The crema here is soupy-thick but the taste doesn’t go overboard with the bitterness. But it is strong enough to leave the sipper needing to take their time (perhaps that is the intention). The coffee on offer each week at Thalmeiner changes, too, to keep you on your toes, and at least one brew on the menu will be roasted by Slovak coffee roaster, Komarno-based Green Plantation (thus the coffee is always fresh-roasted). Perhaps it’s giving that extra thought into how they source their ingredients which is what I was most impressed by at Thalmeiner. They make an evident effort to utilise local suppliers and local recipes for their cakes and sandwiches (a nice touch) and, in the absence of local produce, they at least try to be a bit ecological about where they get their food from (for example, those with a sweet tooth will, like me, also be tempted by Thalmeiner’s hot chocolate – with chocolate sourced from the Mexican plantations). OPENING HOURS: 8am-10pm Monday to Thursday, 8am-midnight Friday, 10am-midnight Saturday, 10am-10pm Sunday. NEXT ON THE JOURNEY: From Thalmeiner it’s 46km south-east to another of Slovakia’s best cafes, the Antikvariat in Nitra.